The safety and ease of handling of a trolley depend on the choice of the most suitable wheel. Calculate the minimum carrying capacity required to guarantee safe handling. This is determined by the weight of the load, its nature(solid or liquid) and the tare of the trolley. Choose the recommended wheel series for the type of floor (nature and condition of the floor) and then select only the recommended categories for the environment of use (temperature, humidity, aggressive chemical substances). Choose the wheel dimensions (diameter and tyre width) having the minimum required carrying capacity to guarantee ease of movement depending on the type of use: static use, manual propulsion, towed mechanical propulsion, self-powered propulsion. • For uneven floors or floors with obstacles the wheels should have a soft, high thickness tread and be of large diameter; • For smooth floors and heavy loads the normal practice is to select wheels with a more rigid tread. For each series, Tellure Rôta indicates the type of floor for which the wheel is suitable. The materials of which the wheel and castor are made may be more or less suitable for use in aggressive environments: extreme temperatures, high humidity, acids, solvents, alkalis and hydrocarbons. – a table showing compatibility of the wheel materials with a detailed list of chemical substances (see table –> open pdf file). – a table showing derating of carrying capacity in accordance with different temperatures (see table –> open pdf file). The load weight, load type (liquid or solid), and trolley tare, determine the minimum carrying capacity required of the wheel in order to guarantee safe handling. (3 out of 4 wheels are considered to be constantly in contact with the ground). (2 out of 4 wheels are considered to be alternately in contact with the ground). Conversely, if the trolley is to be used frequently or over long distances, the type of handling must be assessed: manual, towed with mechanical means or self-powered. Tellure Rôta shows the rolling resistance value for each wheel, this being the maximum applicable load at which the traction/thrust effort remains below 5 daN.The lower the rolling resistance of a wheel, the less effort is required. 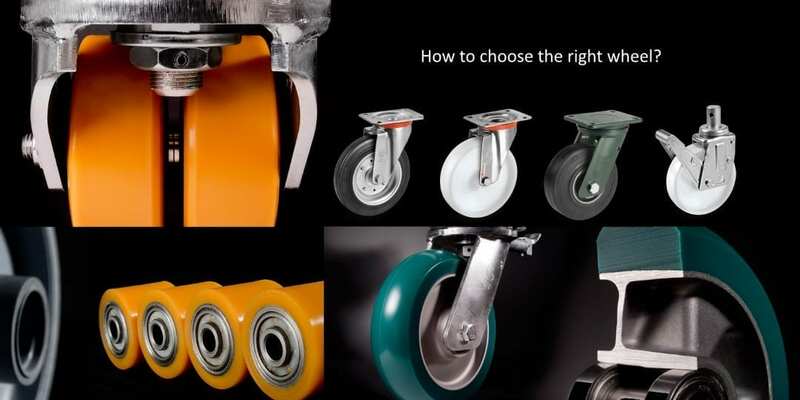 Not all the types of wheel can be used with mechanical propulsion; choose only the series shown in the table, combined with adequate castors. In this case the wheels are subjected to particular types of stress that differ from case to case. Contact Tellure Rôta to choose the most suitable product for your application. We can help you with the correct elements for your next DIY project making sure that you get exactly what you need without breaking the bank and we pride ourselves with our high level of customer care.